You know that feeling you get when a doctor prescribes an opium-based painkiller you're not used to? It's a dull, detached feeling. You're not quite asleep, but you don't really care about much. 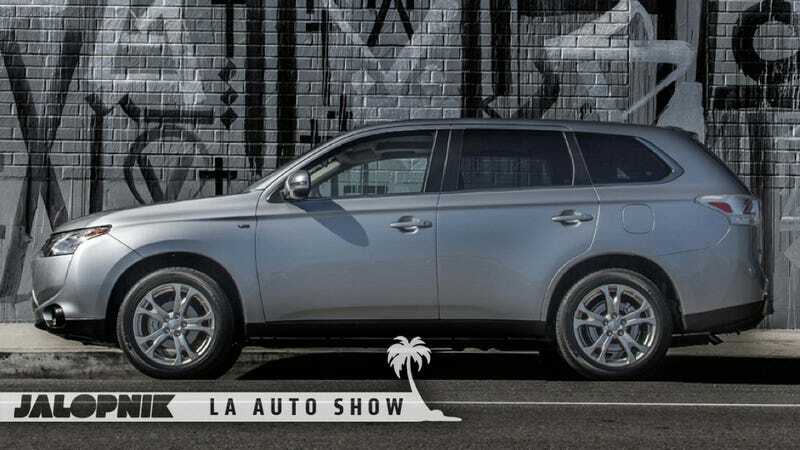 That's the feeling I get when I look the 2014 Outlander Mitsubishi unveiled at the LA Auto Show this week. Sure, clean lines and all that, but it doesn't seem to be much more than a Forester-esque crossover box with inoffensive styling and an uninspiring powertrain. But the new Outlander makes a lot of sense. It's lighter, has an improved 166 hp four-cylinder engine and a continuously variable transmission — which will mean good fuel economy — and it holds seven passengers. That means that it'll appeal to people who need minivans and station wagons but don't want to own up to it. That in turn means that it'll probably sell, which is important to Mitsubishi as is struggles to avoid being edged out by more robust competition from the land of the rising sun. The GT version will have all wheel drive, a 224 hp V6, and a paddle shifted six-speed, so it probably won't be all that bad to drive. Whether or not the Outlander achieves Mitsubishi's expressed goal of boosting U.S. sales remains to be seen. Sure it looks boring, but people buy a lot of Toyotas. The interior seems vastly improved from the outgoing Outlander, which was terrible. Would you consider buying a non-Evo Mitsubishi?